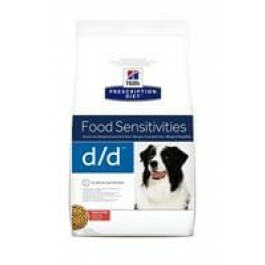 Hill's Prescription Diet d/d Canine is clinically proven nutrition to help avoid adverse reactions to food. There can be a variety of reasons for your dog's itchy, scratchy skin condition, including sensitivities to food and the good news is that most pets with these skin conditions can benefit simply by eating the right food. Hill's Prescription Diet d/d helps to improve digestion and stool quality, helps to maintain a healthy skin barrier, improving the quality of skin and coat and it also supports healthy immune system. This food is recommended for initial management of dogs with any skin conditions. It can benefit dogs with chronic otitis externa, interdigital pruritus or perianal pruritus, which can be signs of an adverse food reaction, as well as dogs with atopy. It also benefits dogs with non-allergic skin conditions by providing essential nutrients. Fish oil, highly purified to exclude any protein residue, is added as a source of omega-3 fatty acids. Single novel animal source of protein (salmon) - helps avoid common food allergens and limits the amount of undigested protein in the intestinal tract able to provoke an adverse reaction. Single source of carbohydrate (rice) - adverse reaction to rice is rare. High in omega-6 fatty acids - helps maintain glossy coat and smooth skin. High in omega-3 fatty acids - helps limit the skin reaction. Added superior antioxidant formula - neutralises free radicals in the skin which is particularly sensitive to them. Brewer's rice, salmon meal, animal fat, digest, hydrolysed chicken (low molecular weight), vegetable oil, minerals, cellulose, fish oil, DL-methionine, L-lysine hydrochloride, L-tryptophan, taurine, vitamins, trace elements and beta carotene. With natural antioxidant (mixed tocopherols). Hill's Precription Diet Canine d/d should be recommended by your veterinary surgeon. For detailed information on feeding amounts and how this food can help your pet, please consult your veterinary surgeon. 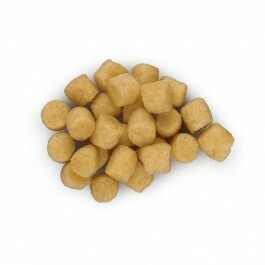 For the best results ensure a graduall transition to&nbsp;your dog's new food over a 7 day period. Exclusively feed the recommended Prescription Diet food and keep fresh water availalbe at all times. Please note that this is a guide only and that individual animals may have different requirements. Adjust the feeding amount to maintain the optimal body weight.